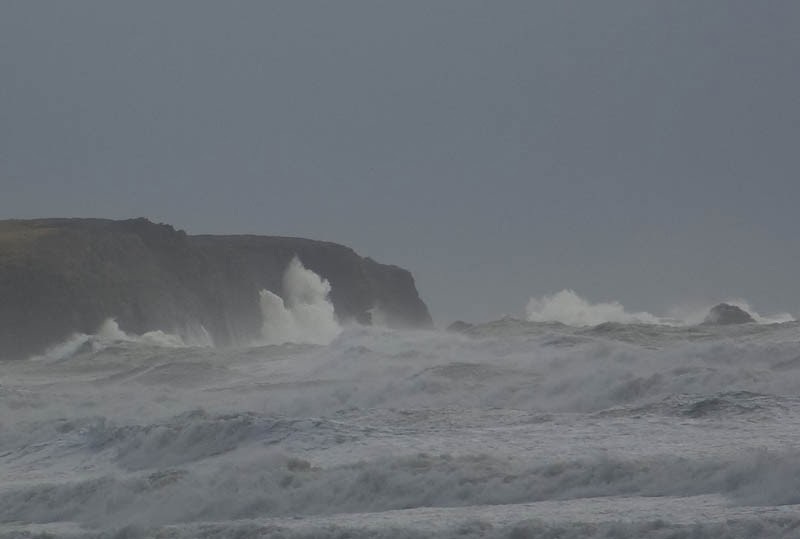 Jenny and I have just returned from Pembrokeshire, rather wind-battered, although the exciting seas did leave me quite exhilarated, with mighty Atlantic waves crashing into Linney Head and shooting up over the tops of 130-foot cliffs, dwarfing them in a wild expression of Nature’s power. Sketching in such conditions is challenging and one page of my sketchbook was torn, but with a veritable row of bulldog clips I managed to keep going and make the most of the stupendous seas. The wave-splashes you see in this pic are fairly small – a mere 100 feet – compared to the really high ones, but I was rather engrossed in the sketching to watch everything. The mood and light was incredibly dramatic, and at times the sky was almost completely black with a thin sliver of light on the horizon. Anyway, make sure you have plenty of clips and elastic bands when you venture forth in these conditions! While I was in Pembrokeshire I delivered some paintings to Art Matters in White Lion Street in Tenby, and they will be going on display in their exhibition on Saturday 22nd February. This detail from one of the paintings illustrates some fine detail drawn with a fine rigger brush. The trunks, gate and fence posts were rendered with a mixture of burnt umber and French ultramarine, but before I apply the paint to paper I ensure the rigger comes to a fine point by dragging it across some scrap paper and at the same time twirling it between first finger and thumb. You need to practice this technique of drawing with a fine brush as it takes some getting used to, but you might find it easier to first of all try drawing with a brush as fine as a rigger, but with shorter hairs. If you visit the exhibition you’ll see that this painting is a little different from the detail part shown here. After scanning this I decided to include some chickens and a cockerel, as the building looked a little forlorn. Unfortunately I forgot to re-scan it! The gallery telephone number is 01834 843375. If you click on the link above you will reach their website with all their details. 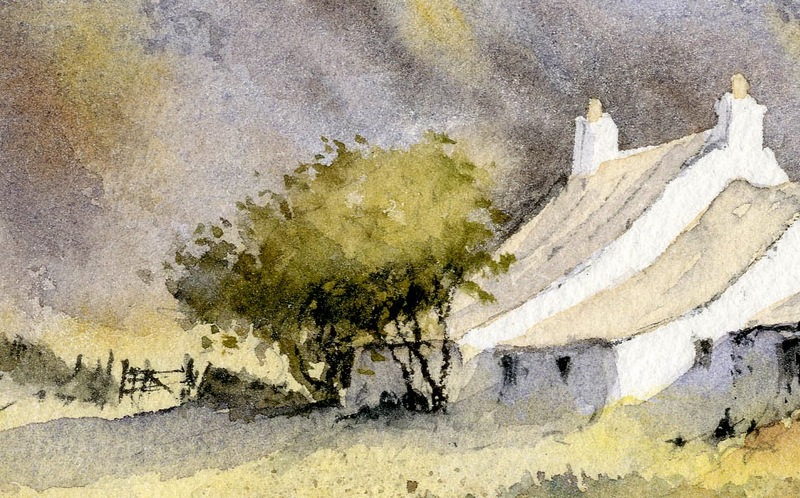 This entry was posted in David Bellamy, Drawing detail with a brush by David Bellamy. Bookmark the permalink.